Welcome and thanks for stopping by The Wiggles & Squeaks Shoppe! My name is Kar and I am the mastermind behind all the creations in this little shoppe. Although, I do get lots of helpful advice from the kind, quality-control people who live with me. It seems like I have had a love for making things forever. I was always sitting and watching my Mom and Mema make and create things all the time. Clothes, quilts, curtains. You name it, they probably made it. They have always been a huge influence with my love for making things. I took my first HomeEc class in 7th grade and it was my favorite class in school. As a wife, mom of three, mema of two and auntie to several little ones, I am always making things for these special people in my life. Always hoping that all my creations will make them smile, do a happy dance, squeal and know that they are dearly loved by me. I love yarn and fabric. I am constantly going back and forth between the two when making things. Blankets and quilts are my favorite things to make, with a few other things for around the house to make things feel cozy and just right. My biggest inspiration is color. Color inspiration comes to me from everywhere. Pictures, nature, clothes, paint, etc. Everywhere. With that inspiration I come up with my unique creations. And each creation has my heart & soul and love put into it. I would like to thank every handmade lover out there for their support. I hope you know that each purchase you make keeps me working at my dream of making, creating and helping my family in any way possible. You are the best! And know that you are getting the absolute best from me! Creations that I hope you will enjoy and "Wiggle and Squeak" about. *The Wiggles & Squeaks Shoppe is a small home based business registered in the state of Idaho. *All handmade items are made solely by myself with the love and care as if it were being made for someone dear to me. I strive to make the best items possible to sell in my shop that can be considered keepsakes later for those who own them. *All handmade items are made in a pet free, smoke free home. *Due to computer screen variations, colors may appear different than in person. *All crochet blankets & quilts should be washed with gentle cycle (no bleach) in warm water and then tumble dried alone. 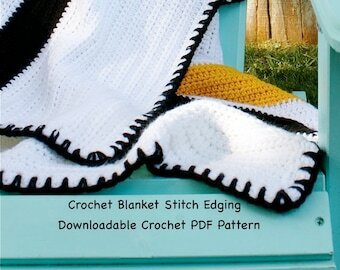 *My crochet blankets are made using acrylic yarns because of their durability and longevity so you will be able to use them over and over again for continuous warm snuggles. My quilts are made with the highest quality cotton quilting fabrics I can find along with quality cotton batting and cotton thread. *Receipts are not included with the shipment for the simple fact of keeping costs as low as possible for both myself and my customers. If a receipt is needed, please print out the electronic receipt from the confirmation of the order you have placed with me. *If you have any questions about anything you see within this shop, please contact me through the contact link. I will do my very best to get back to you within 24hrs. *Items are only shipped within the US. No international orders. *All items are shipped via USPS Priority Mail. You will receive a tracking number via email once the order is sent out. *All orders are usually shipped by 1-2 business days upon receiving payment. *If by chance you are not completely satisfied with the handmade product you ordered, you must contact me through the contact page on this site within 7 days of delivery so that we may work something out. *All items being returned must be in the original, unused condition as it was sent out to the customer, within 14 days of delivery. *Buyer is responsible for the cost of return shipping. Original shipping cost will not be refunded. *There are no refunds on any digital patterns. Thanks for visiting The Wiggles & Squeaks Shoppe!